Kyocera has released a free app that links with Google Drive and Evernote to provide access to files in a cloud store through its multi-function printer control panel. Named Cloud Connect, the application uses Kyocera's Hybrid Platform for Advanced Solutions (HyPAS) software and removes the need for a computer, tablet or smartphone to get at the data. 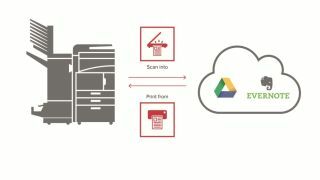 It makes it possible to scan files and send them directly to accounts on Google Drive or Evernote, and to print directly from either of the platforms. Kyocera says it works with file formats including jpeg, PDF and tiff, and that files can be found by browsing tagged or starred content, or by searching for keywords. A company spokeswoman told TRPro that it has plans to make the application work for other cloud platform providers, but that it cannot yet provide any details of which ones. What's best for you? Google, Evernote or Apple Notes?